What is alcohol related dementia? Alcohol related dementia is, as the name suggests, a form of dementia related to the excessive drinking of alcohol. This affects memory, learning and other mental functions. Korsakoff’s syndrome and Wernicke/Korsakoff syndrome are particular forms of alcohol related brain injury which may be related to alcohol related dementia. It is currently unclear as to whether alcohol has a direct toxic effect on the brain cells, or whether the damage is due to lack of thiamine, vitamin B1.Nutritional problems, which often accompany consistent or episodic heavy use of alcohol, are thought to be contributing factors. Key parts of the brain may suffer damage through vitamin deficiencies, particularly marked levels of thiamine deficiency and the direct effect that alcohol has on the absorption and use of thiamine. Generally skills learned earlier in life and old habits such as language and gestures tend to be relatively unaffected. Who gets alcohol related dementia? Anyone who drinks excessive amounts of alcohol over a period of years may get alcohol related dementia. Males who drink more than six standard alcoholic drinks a day, and women who drink more than four, seem to be at increased risk of developing alcohol related dementia. The risk clearly increases for people who drink high levels of alcohol on a regular basis. The National Health & Medical Research Council of Australia recommends that for health reasons related to the prevention of brain and liver damage adult males should drink no more than four standard drinks per day and adult females should drink no more than two standard drinks per day. Some people who drink at high levels do not develop alcohol related dementia, but it is not currently possible to understand and predict who will and who won’t develop alcohol related dementia. Some people who develop alcohol related dementia might also show some degree of recovery over time if they reduce alcohol intake to safe levels or abstain from alcohol and maintain good health.Alcohol related dementia can affect both men and women of any age. At an early stage of the disease, problems may be reduced or reversed if the person abstains from alcohol, improves their diet and replace vitamins especially thiamine and vitamin B1. Thiamine is important to limit some of the toxic effects of alcohol, and is an important supplement for heavy drinkers. Community support is available for the person with dementia, their family and carers. This support can make a positive difference to managing dementia. Many people who develop alcohol related dementia are young, and this can mean that they and their family and carers will need extra consideration. It may be helpful to talk to a counsellor at Dementia Australia. 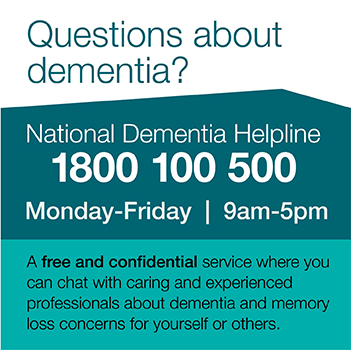 Contact the National Dementia Helpline on 1800 100 500. Al-Anon is a self-help group that provides support to people affected by someone else’s drinking. Alcoholics Anonymous is a self-help group for people who have problems with alcohol. Their contact number in each State or Territory can be found in the phone book, or by contacting the National Dementia Helpline 1800 100 500.